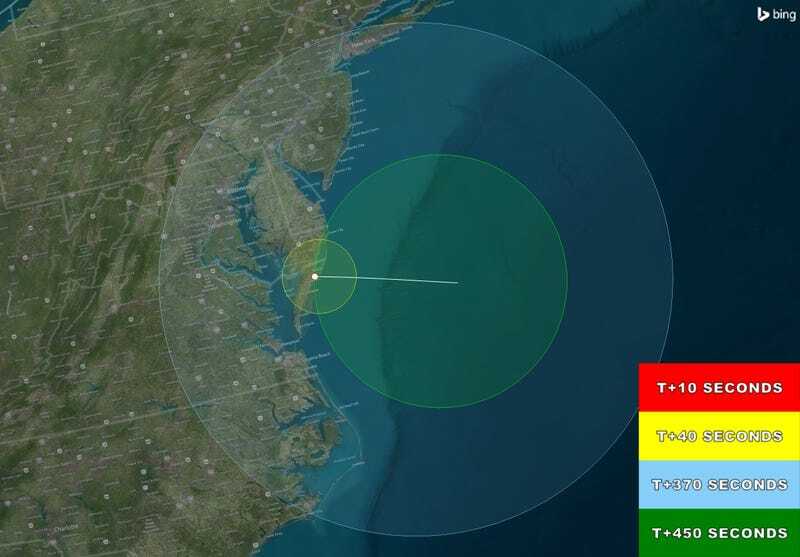 If you’re on the east coast tonight, keep an eye on the sky between 7pm and 9pm: NASA is launching a test of some new tech that will include releasing colorful vapor tracers 130 miles above the Earth. It sounds like it’s going to be beautiful. The idea is to test how well this suborbital rocket can eject payloads, eventually being used to shuttle micro-sats and other experiments. It’s also a test to see how well the rocket’s payloads can be for using vapor tracers to study the atmosphere itself, including phenomena like the aurora borealis, according to NASA. But for most of us, it’ll just be a beautiful light show: NASA says the vapor trails will be visible as far north as central Long Island, and as far south as Jacksonville, North Carolina. Keep an eye out, and post your pictures here. Tonight’s launch is actually pretty interesting, sky show aside. NASA is testing a sounding rocket—which are used to launch sub-orbital payloads like satellites—that’s been modified using some emerging fabrication tech, new materials, and 3D printing, too. For instance, board the launch will be three different types of carbon nanotube materials being sent up for testing, and there will be 3D-printed structures on board, too. Then there’s a new fabrication process for building rockets: The front section of the rocket was created using something called “near net” shaping. Normally, the pieces of the rocket would be machined out of aluminum and welded together, explains NASA, which calls that “expensive” and “risky.” With near net shaping, the fabrication process, in this case of a rocket cylinder, is pared down to a single step producing a single piece, no welding required. According to NASA, all of these processes and materials could end up making a 60% reduction in mass on spacecraft and launch rockets. We may not see any of that technology for a few years–but tonight, starting at 7:00 pm ET, look up and see the beautiful evidence of its launch (and post your pictures!). Update: You can watch the live stream of the launch on NASA TV beginning at 6PM here. A previous version of this post referred to this as an orbital mission, when in fact it is suborbital.